‘It’s mouth looks like a comical monster’ she said, and now there is no unseeing it. On Christmas Vacation in Mendocino county where it’s 60 degrees in December (now THAT’S a Christmas miracle, it’s freakin 20 degrees back home in New Hampshire), I was struck by the mossy, gnarled and arid beauty of Northern California, and thought, wow, I’ve become one of those old guys who tells their kid “Hey look it’s a particularly interesting kind of fungus’ when the kid just want to go go-karting or something. 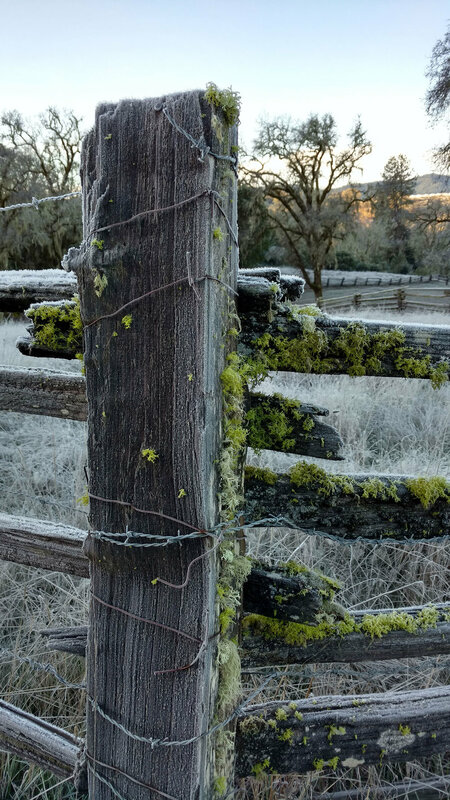 I was particularly impressed with the oddly beautiful death and dormancy of winter plants: Old blackberry vines and oak, madrone and wide, frosted fields, misty and earth toned… wildly contrasting the New England omnipresent supergreen treelines/frozen snowy winterscapes. I took some photos but they do no justice; in the photos the immediacy of awe is lost, they’re just images. Looking at the photos I have to ask myself is it really gorgeous? Or am I just programmed to believe it’s gorgeous because I grew up there? Only an artist would ask that question: Can I use this? If I draw these things will other people like them? ‘Will New Englanders like California birds?” is a perfect example of overthinking it. Just draw the damn birds, Ty, do your art and shut up. One in a thousand people could care less, the only reason this works is because there are millions and millions of people. At a local cafe called the Brick House in WIllits, CA, Sara and Tom Mann, the owners and old, old friends, encouraged me to put an art show up towards the end of summer 2019 and I will. It’s impractical: If the show is wildly successful it’ll maybe cover the cost of the plane trip out and a week off work plus a little, but that’s alright: At that point I’ll have had my Portsmouth art show and with any luck the Sunapee Craftsmans’ fair, and will have a lot of prints onhand to display and some some brutal experience under my belt… and it’s a fantastic excuse to come to Northern California during blackberry season, so let’s rock! 2019 starts tomorrow… The trick is to back off on T-Shirt print jobs (so starve a little more) and get these fine art prints in full production. That will get me closer to my wildly impractical goal of being a pen and ink genius before I die. Pretty good use of a lifetime, I guess. Okay, I gotta get to San Francisco to get on an airplane.